Cyclists, skiers or anyone else that is looking for a lightweight, combination lock that will help secure your belongings when needed, yet will also stow away to a compact and easy to manage bike lock. Are sure to be interested in the new Ottolock. 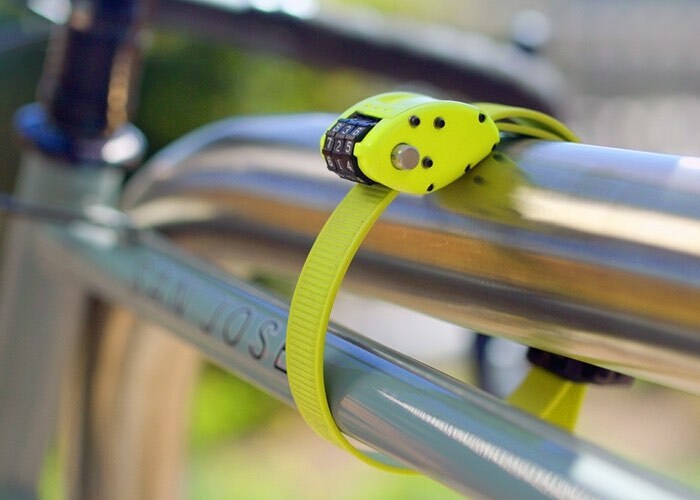 Otto lock is a new and innovative cinch lock for both cyclists and outdoor enthusiasts that require a lightweight, secure and compact solution. Watch the video below to learn more about its design and locking mechanism. OTTOLOCK solves your security problem with a patent-pending, multi-layer steel band design. It’s simple and versatile, but surprisingly stronger than meets the eye! In or around your saddle bag, in your pocket, or anywhere you want: OTTOLOCK is so lightweight you won’t even know you are carrying it. OTTOLOCK is extremely cut-resistant because of an engineered design that uses multiple layers of high-temper, 18mm-wide stainless steel bands coated in Santoprene (a highly durable plastic) combined with a Kevlar band. Under load, the bands slide upon one another and effectively reduce shear forces. Conventional theft tools like wire or bolt cutters are just not enough to cut the OTTOLOCK. OTTOLOCK has applications beyond bicycles! Ski/Snow, Auto/Truck Cargo & Racks, Travel/Luggage/Gear, Tools, Camping, Motorcycles, Scooters, Surfboards, Canoe & Kayak. The possibilities with OTTOLOCK are limitless. For more information on the new Ottolock jump over to the Kickstarter website for detailsAnd to make a pledge from just $44 via the link below.